It’s been a weird couple of weeks in between the pipes for the Detroit Red Wings. The tables have supposedly flipped, with Jimmy Howard finding his game at the same time as Petr Mrazek has lost it. Many are concerned with what’s going on, and it’s not hard to blame them, but the swap of form might be a long-term positive for the team. This should be the most obvious one. Jimmy Howard is sitting at a 0.907 SV% this season, which is the worst that he’s had in a full season in his career to date. At 31 years of age and in the midst of his third consecutive season with a below league average save percentage, it doesn’t seem likely that he’ll make a return to glory, but it’s always nice to have your players performing to the best of their ability. Especially when you’d like to move them. As we all know, Jimmy Howard’s contract goes until the end of time (July 2019) and his $5.3 million cap hit is a steep one for a Cap Ceiling team to swallow, especially when they have other capable talent at their disposal. If Howard can finish his season on a high note, it will make it a lot easier to move him at the draft for a player in a position of need, or barring that, picks or “bad” shorter term contracts to make the salary impact disappear faster. Howard’s name still carries a pedigree to it and he’s yet to have an all-out disastrous season, so there could be interest with a solid closing month attached. Petr Mrazek is the Red Wings’ long-term starting goaltender. You know it, I know it, everybody knows it. He’s been well above the curve in the first 90+ games of his NHL career, just like he was in the AHL, ECHL, OHL, in the Czech junior system, and at the international level. Everywhere the 24-year-old goes, he dominates. But he’s had a couple of rough weeks. The timing couldn’t be better, though. Mrazek is a restricted free agent in July and will require a new, presumably mid-to-long term contract from the Red Wings that commits to him as the team’s franchise goalie. But as long as his numbers were at “Vezina Trophy” finalist, his asking price was going to be higher and higher. A few humbling performances will do a world of good in keeping his agent from overselling him, and will make Mrazek’s pay-day look more like a Howard do-over than a Henrik Lundqvist cash out. In a cap world, every dollar matters, and if a couple of weeks that we all know ill pass can make an impact on who the Red Wings can afford in a few years, it’s worth the temporary pain. The big talking point with the Wings right now, no doubt, it’s whether they can keep their 24-season Playoff Qualification streak going. It’s a great long-term accomplishment that nobody wants to spoil, after all. But here’s the thing; Detroit needs to earn it, not have it handed to them. The past few weeks have been rough. The team’s underlying numbers have been good over the past month, but with 22 goals in their past 13 games, they haven’t provided Mrazek and Howard with much support. There have been multiple times this year where the two have had stellar performances thrown away by a lack of goal support, costing the team standings points that they could really use right now. But that’s the thing; if you’re going to talk about winning as a team, you need to win as a team. Perhaps not going into games with the assumption that Petr Mrazek is probably going to play, and play well, is the kick that the rest of the group, from the coaching staff to the skaters moving the puck, need to push the team to a competitive level ahead of the playoffs. As much as support is necessary, the team should never feel too comfortable. Overall, there could be a lot of good things to come out of this blip off the radar’s typical course. A boost in Howard’s trade value, a drop in Mrazek’s contract demands, and a layer of eagerness painted on top of Detroit’s skaters would all be welcome occurrences, both for the sake of the presence and for the future. Now, it’s up to all of the aforementioned to see what they can do with the final few weeks. 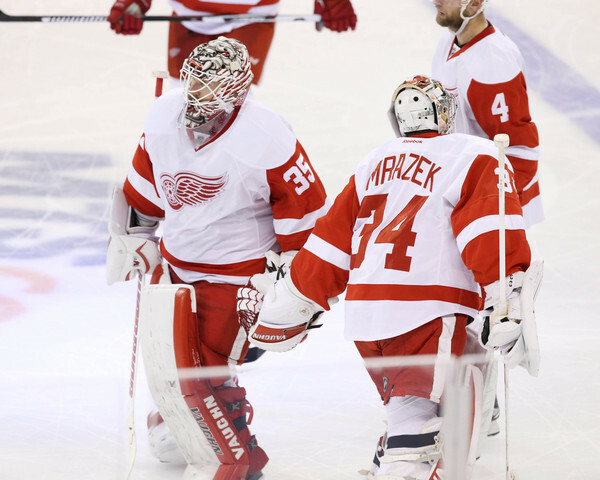 What’s Next For Jimmy Howard? Nice write-up, good points. I’d definitely like to see them ride Howie while he’s hot, and give Pete some rest for a hopeful playoff run and some motivation for when he does come back. Not at all worried about Pete’s slump.